So you decided to enter or reenter the trading card and memorabilia collecting world. Great! Maybe you are a new collector or just returning to the hobby of your youth. Or perhaps you are looking for the perfect gift for the sports fan on your list. Either way, eBay provides plenty of opportunity to find trading cards and memorabilia of your favorite players, teams, movies, TV shows and more. Here is a look at the top five tips for new eBay trading card and memorabilia buyers. Be sure to register for an account before you get started. 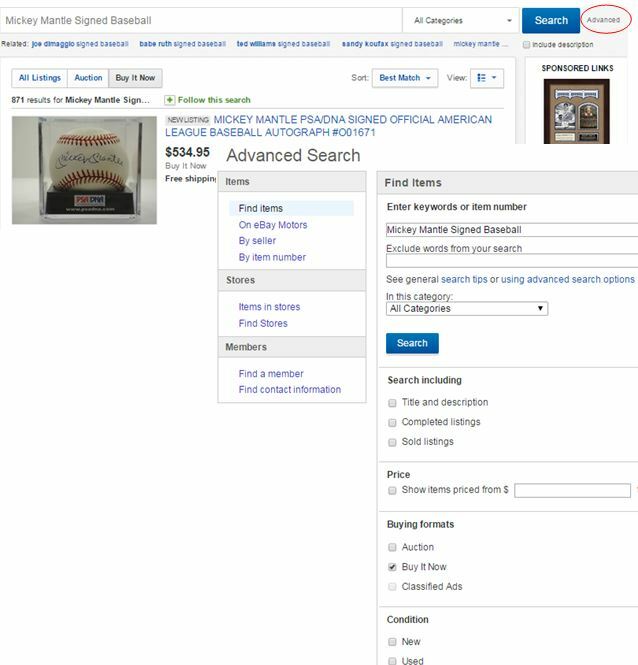 One of the most important things to remember when looking to purchase trading cards or memorabilia on eBay is the correct use of search terms. To generate the most accurate results, searches should be as specific as possible. To accurately narrow down the number of choices include the specific type of trading card or memorabilia you are looking to purchase. 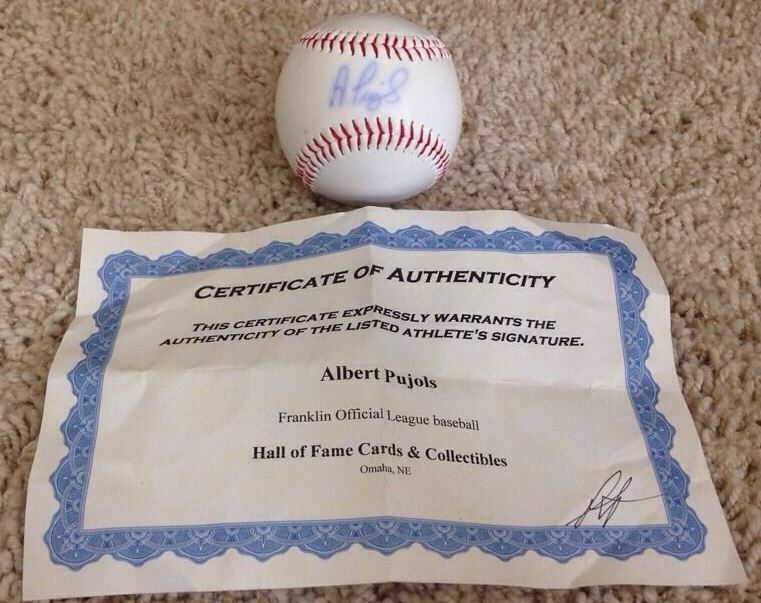 Instead of "Albert Pujols" try "Albert Pujols Topps Autograph." The difference in the number of results to sift through can be extraordinary and save you precious time. Different sellers sometimes use different terms as well. By using brackets, you can expand your search to include multiple terms. 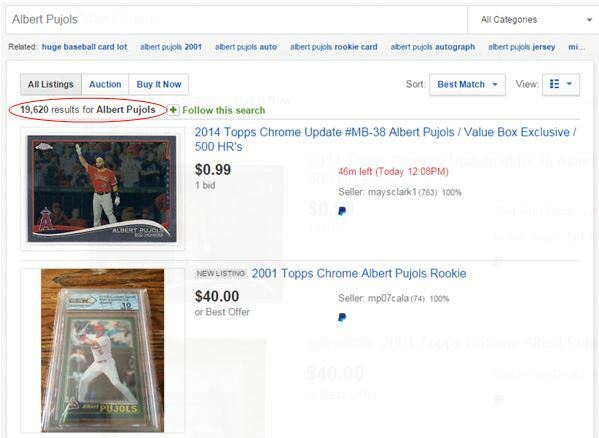 One common example with sports cards is the use of "auto" instead of "autograph." 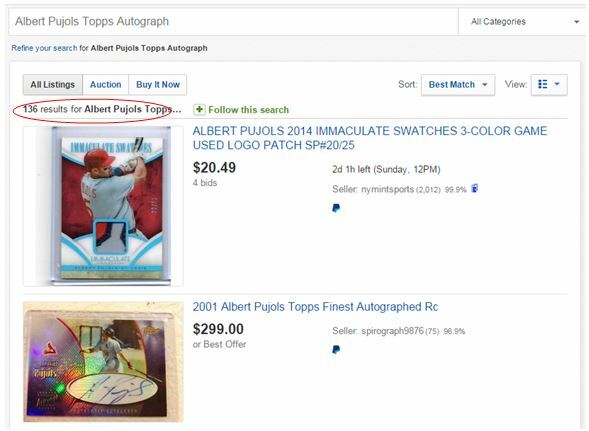 So a search like "Albert Pujols Topps (auto,autograph)" keeps your results fairly specific while making sure you're finding everything you're looking for. Buying Format - Is the item being sold as an auction item or being sold via the site's Buy It Now format? Price - You can see search results listed by highest or lowest price first. Timing - How quickly do you need to purchase the item? This filter shows you results that are ending the soonest. New Listings - Have you searched for an item recently? Do you just want to see items newly listed? This filter can do that. Sold Items - Want to know what an item is worth or what it has recently sold for in comparison to an item you are considering purchasing? This is the perfect tool. It will show you completed transactions giving you the prices sold for similar items over the last several weeks. Condition - You can often save lots of money purchasing an item in good used condition, versus one that is new. Or if you only want to look at new items, you can filter those as well. Unfortunately, as great as eBay can be to purchase gifts or add items to one's personal collection, it also a place where you find lots of fake autographs. However, there are steps you can take to ensure what you're buying is authentic (or at least have the highest probability of being real). eBay's stringent policies make it very difficult for every seller to maintain a 100% positive feedback. This is an asset to you as a buyer because it helps to insure a fair, competitive and accurate system. More importantly than just a seller's overall feedback score are the specific transactions and resulting comments from buyers who have left neutral or negative feedback. Read them carefully and look for trends before purchasing. Any autograph "authenticated" by any company, other than the ones listed here, should be treated with caution or avoided. This saying has been around forever. It is still true today, especially in the world of autograph and memorabilia authenticity. 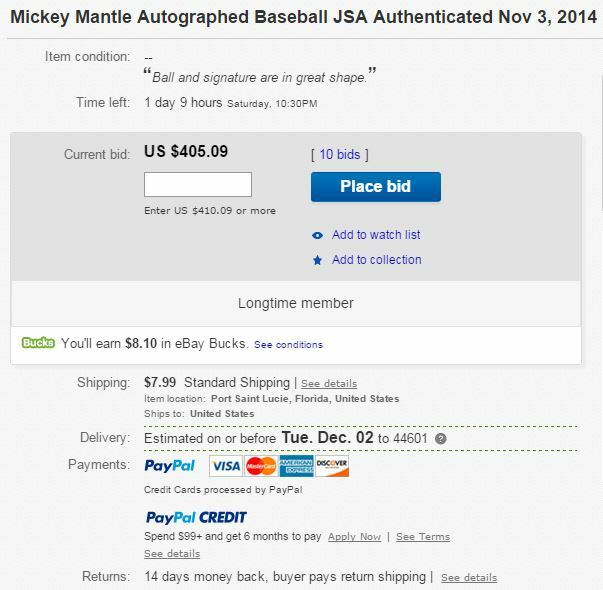 If you are looking to purchase an autographed baseball of Mickey Mantle or another legend or star player, there is typically a price range that the item sells within. Obviously, there will be individual characteristics specific to each item that will influence the item's price. These can be things like, quality of the signature, type of pen used to sign, when it was signed in the player's career, etc. 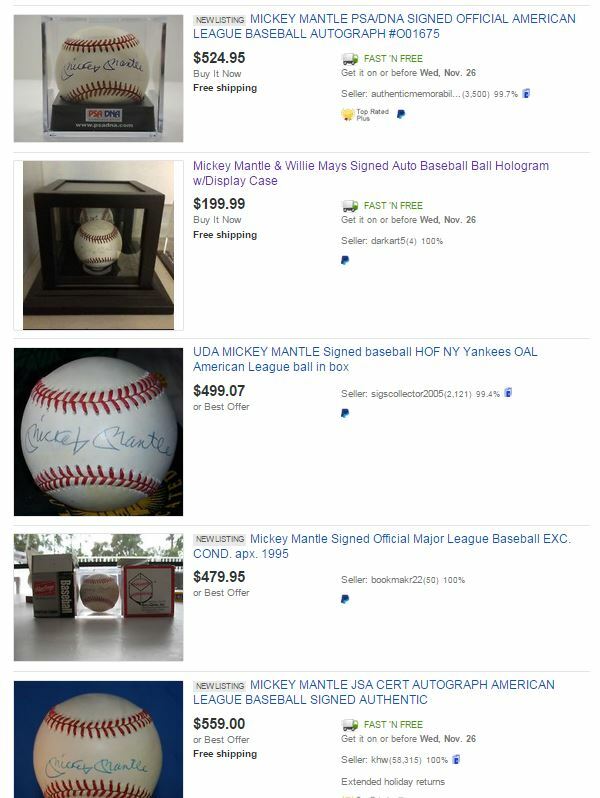 However, if you find that perfect ball or piece of memorabilia and it is listed significantly below the price of other Mickey Mantle signed balls, you have to ask yourself, "Why?" The picture below lists a perfect example of a listing that should give a buyer a reason to pause. 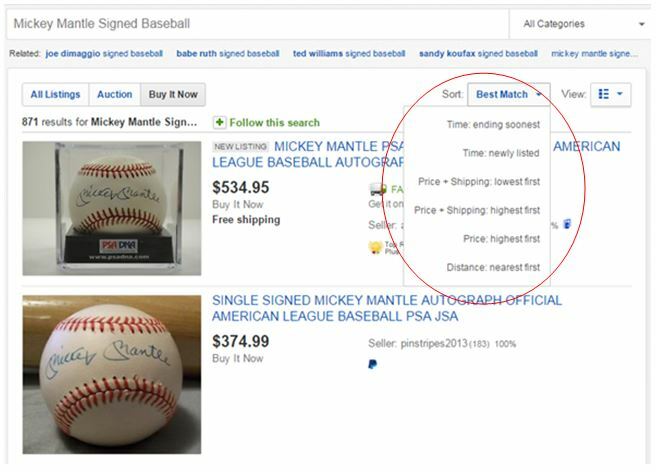 The highlighted ball (second on the list) has a Buy It Now price well below the typical price range of a Mickey Mantle signed baseball. Why? What do all the abbreviations and acronyms mean and stand for? Good question. The world of trading cards and memorabilia has it's own terminology just like that of any other hobby. Here is a look at some of the more commonly seen terms and what they mean. Hobby vs. Retail - Most new trading card products are packaged in two different configurations. Hobby products are distributed to local card shops and licensed online retailers. Retail products are those reserved for your big-box stores like Target and Walmart. Usually, hobby costs more, but you're likely to get more premium items like autographs and memorabilia cards. Blaster - A product packaged for retail with less packs than a traditional retail box. On-Card or Hard-Signed Autograph - Today's trading card manufacturers often use stickers for athletes and celebrities to sign. Once returned, they are then applied to the appropriate trading card. Cards that are signed directly on-card or hard-signed often carry a premium value over similar sticker autographs. Memorabilia or Relic Card - These are cards that contain a material swatch, usually worn or used by the card's subject. Card Grading - The condition of a card is important to its value. Third-party grading services provide an objective opinion of a card's condition and assign it a numerical value. The companies that provide this service are often referred to by their initials. Trusted companies include: Beckett Grading Services (BGS), Beckett Vintage Grading (BVG), Professional Sports Authentication (PSA), International Sports Authentication (ISA) and Sports Card Guaranty (SGC). There are several other slabs out there, but it's best to stick with ones widely accepted by the hobby. Like certificates of authenticity, anyone can put a card in a slab. Condition - Cards are referred to by their condition in the following terms. Specific grading companies also use their own terminology in such cases. However these are the ones that are most common. Pristine, Gem Mint - A perfect card. Excellent (EX) - A card with only a minor flaw. Very Good (VG) - The card may have several minor flaws. Good (G) - The cad is well worn with several flaws. Fair (F) - The card is barely adequate condition to call it collectible. Poor (P) - The worst possible card condition. Authentic (A) - An authentic card without a condition grade. Short-print - A card produced in smaller quantities than that of other cards in the product. Parallels and Refractors - A card produced in a smaller quantity than the base version of the card and featuring some sort of distinguishing characteristic like serial numbering, printing technology used, color of the card, etc. Refractors are a specific type of parallel found in a lot of chromium-style sets. Above and beyond the price of an item, there is often a cost associated for postage and handling. It's important to remember that for the seller, shipping supplies cost money and postal rates seem to be constantly on the rise. The cost of shipping is listed just below the current bid or sales price of an item. Often times a seller will offer free shipping but increase the price of the item to help offset those costs. Unless explicitly stated, insurance is typically not included in the shipping and handling cost. If you want to have your items insured or delivered through a different service than that offered by the seller, you will need to contact them before bidding or purchasing the item to ask those questions. The seller is under no obligation to submit to your request. That being said, both eBay and Paypal do offer buyer protection on most items to help protect both the buyer and the seller. Additional details also listed along with pricing for shipping are: expected delivery date, return policy, payment methods accepted. 2015 TOPPS ARCHIVES JOC PEDERSON RC AUTO 037 199!! Looking through your authenticator list, I wanted to point out one very big mistaken inclusion and one which should be stated. JSA is well known for a lot of mistaken authentications as well as false rejections. Take a look at the backlash faced by Mounted Memories/Schwartz when they used JSA instead of PSA as the on site authenticator in the autograph area. In short, JSA’s paper may be worth a slight upgrade from Scott to Charmin toilet paper. The one you are missing is Schwartz Sports. They are the Chicago base of Mounted Memories/Fanatics. If you do mail order or eBay through them/MM, they very likely will be the sticker & small card attached to your item. Before the family merged with MM, they ran the Chicago area for close to a decade (they still do all of the logistics for the auto area) and in my dealings with Brian and his brothers they have always come across as standup guys. ALSO, I’ve yet to have a single item rejected by PSA. If you are buying something with a PSA on-site authentication record ask for the seller to produce a ticket stub or other proof that he actually had it signed there. Mounted Memories has made the Chicago autograph area way too easy for fake autos of those there to be run through the PSA and be given the authentication without even a second thought. Another thing I do all the time when looking for throwbacks or just something to throw up on the wall (not as an investment) is buy autos on mini helmets I want to add to my collection and whose price is within $5-10 of the item without auto. I’ve done that recently with throwback Patriots and Oilers helmets. I’ve also bought B-list signed (Hank Blalock and such) bats at the Chicago shows where the cost was almost identical to what the bat sells for unsigned. It really helped me when you said that hobby product is distributed to local card shops and licensed online retailers. My brother is a big fan of baseball, and he’s planning to collect baseball trading pins. I will share this article with him so that he will have an idea of purchasing trading pins.